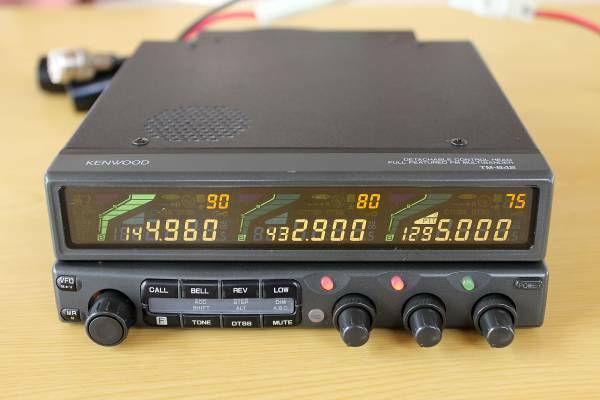 Kenwood TM-842SniUT-144S. extension did TM-942S specification. . UT-144S is new goods inserted . reception frequency enhancing goods. . accessory is not body only. . Cross band repi-ta modified ending .DTSS standard installing . Memory is 1 band per 200chno600ch specification . lithium battery ( holder type ), panel inside electrolytic capacitor , backlight is exchange doing . backlight is LED. is doing sending reception frequency gap is no problem power is 144MHz.50W,430MHz.37W,1200MHz.10W go out. Separate long cable preparation if so body . panel . separate . possible to use . moreover, , already 1 pcs long cable . in case of being front panel is top and bottom . minute ... therefore display part . operation part . another . place . installation do use do also possibile . disassembly cleaning is doing . scratch etc. is equipped .